Patrick Ness conflicts this effect on me. It’s called; omgithinkivegonementallydisabled and iwantmoremoremore! After The Chaos Walking Trilogy, I was left wounded and when I found out that he wrote this lovely-creepy looking book, I went just a little insane. So get prepared for an insane review of A Monster Calls. Conor has nightmares, about a monster. Then one night, Conor wakes up at midnight to see a monster. But it isn’t ‘the’ monster from his dreams, it’s a different monster which happens to do two things;tell tales and demand the TRUTH But what is the truth? Conor has a mother at the brink of death, a father who rarely visits, a grandma who doesn’t have much of a connection with Conor and a school that misunderstands him. So why on world would a monster demand for the truth to such a miserable, disconnected life? Siobhan Dowd had originally created these characters, premise and a beginning to this unfinished book. She had everything but time. Patrick Ness, was asked if he could finish this book. With reluctance and thought, this beauty was born. Thank you Siobhan Dowd for such a great story line. This is my favourite book by you just as it is of Patrick Ness. Conor is a likeable figure of the book. This thirteen year old has great strength in his mind and courage. I felt immediately attached to him after the first paragraph. After that, I found Conor to be strong willed, determined and clear minded. Not one of those clueless dull headed characters. These drawings to my friends are described as ‘creepy and weird’ my description? I think no other artist (Jim Kay) could have depicted or thought of any better pictures to go with Patrick and Siobhan’s story. I love all of you three and hope to see more of your works in the future RIGHT NOW THIS SECOND. 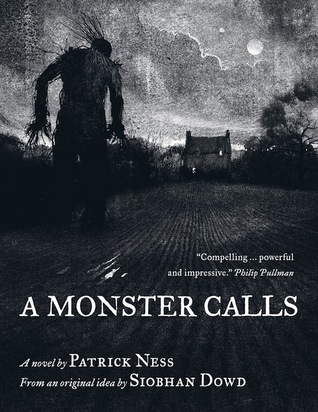 Overall, I thought that A Monster Calls was a great novel by Patrick Ness which really deserves more publicity. It deserves more (in my opinion) than Harry Potter, Twilight, Fallen and all those hyped books with no reason. Read it. ANYONE. Wow! We have the same thoughts about the book and the author! Ness is really a genius, and this book should be read once by everyone!